Caixin | China’s central bank recently made a “targeted reduction” of banks’ reserve requirement ratio, less than two months after its last such move, drawing market attention. Some people believe that the latest reduction is a continuation of the shift toward a combination of looser currency policy and tighter credit policy, rather than an overall opening of the monetary floodgates. Others believe that this reduction signals that the central bank is releasing controls on the growth of the money supply and no longer emphasizing hedging, and that monetary policy has been dramatically changed rather than fine-tuned. Considering the deviation of China’s economic cycle from its financial cycle, and more so the deep structural contradictions of its economy, we believe the basic direction of monetary policy has not changed. China’s monetary authorities have rich experience and are too thoughtful to hastily change the direction of their policies. As the central bank explained, the recent reduction is intended to fulfill the State Council’s recently stated aims of further promoting debt-to-equity swaps that are market-based and legal, and increasing support for small enterprises. A two-pronged approach of underpinning while nurturing will help consolidate the microeconomic foundation of China’s real economy while meeting its urgent need for high-quality development and supply-side reform. The main reason some think that China’s monetary policy has undergone a “great change” is the central bank’s recent emphasis on maintaining a “reasonable” level of liquidity. But the central bank’s emphasis on liquidity should not be taken out of context. Take, for example, the central bank monetary policy committee’s quarterly meeting on June 27 as an example. The relevant complete statement issued at this meeting was: “Prudent monetary policy should maintain neutrality. It should be of moderate tightness, manage the floodgates of the overall money supply, and maintain a reasonable level of liquidity. Monetary credit and social financing should be guided toward rational growth.” This shows that, while the details of monetary policy may be changed, its general form has been maintained. The central bank is still fine-tuning policy and striving to achieve a balance between stable growth, deleveraging, risk prevention, strengthened supervision and other policy goals. China’s monetary policy has indeed recently shown signs of loosening. Since the start of this year, with domestic and foreign demand weakening, the Chinese economy has faced substantial difficulty, with tightened credit and high-risk cases occurring frequently. At the end of May, the year-on-year growth of social financing reached a record low, while the cost of social financing increased. China’s economic growth may continue to slow in the coming months. According to the central bank, since the beginning of this year, funding has been slow to fall into place for market-based, legal debt-to-equity swaps where the contracts have already been signed, and there have been difficulties in the implementation of these swaps. At the same time, it is still notably difficult and expensive for China’s small enterprises to obtain financing. In view of this, the central bank very much needs to lower the reserve requirement ratio in order to release a certain volume of liquidity. The central bank’s aim to “maintain a reasonable level of liquidity” is its response to this complex situation. However, we do not think the central bank intends to release a “flood” of liquidity to stimulate the economy. History provides many lessons against taking this approach. After the global financial crisis, China’s financial industry ballooned rapidly, unlike the shrinking financial industries of major developed economies, thanks to the Chinese government’s anti-crisis measures. However, this process created many hidden dangers, posing great risk. The entire country is now bracing itself to face these dangers. In recent years, China has striven to rectify financial chaos and improve its two pillars of financial regulation — monetary policy and macroprudential policy. It has worked hard to bring the financial industry back in line with its original purpose of serving the real economy, through strong supervision, deleveraging and risk prevention. Flooding the economy with liquidity would be akin to drinking poison in the hope of quenching thirst, doing more harm than good. 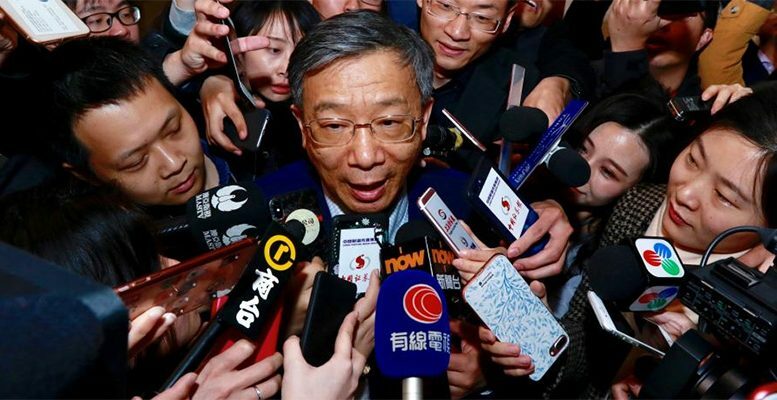 The current situation is forcing the government and China’s academic community to seriously consider the challenges caused by the divergence between the country’s economic and financial cycles. In the past, the peak of China’s financial cycle coincided with the trough of its economic cycle. Now, the two cycles still diverge, although they have moved somewhat closer. On one hand, this ensures that the economy has some degree of resilience. On the other hand, it means that deleveraging, on the whole, implies financial contraction. This places the central bank between a rock and a hard place. In recent years, the central bank has continuously explored and improved its dual-pillar regulatory framework, comprising monetary policy and macroprudential policy in order to balance steady growth, deleveraging, strong supervision, risk prevention and other requirements. The central bank has also introduced a number of innovative tools, including short- and medium-term lending facilities and pledged supplementary lending. It has also occasionally made cuts to the reserve requirement ratio to keep market liquidity at a reasonable level. However, these exploratory moves do not amount to a complete release of liquidity controls, but are instead methods of structured easing. In the future, the central bank must not only maintain a stable and neutral monetary policy, but it must also be flexible and plan ahead while grasping the dynamics and rhythms of structural deleveraging in order to create a monetary and financial environment conducive to high-quality development and supply-side structural reforms. With the decline in funds outstanding for foreign exchange in recent years, as well as a reduction in the volume of base currency put into circulation, lowering the reserve requirement ratio has become the rational choice for a stable monetary policy. As the required ratio has been relatively high for China’s large-scale financial institutions for many years, there is significant room for lowering it. The central bank’s downward adjustment of the ratio will naturally loosen monetary policy to some degree. However, this is not equivalent to adopting a loose monetary policy overall. The central bank has chosen to emphasize “maintaining” liquidity. From this, we can see that the central bank does not believe that the current level of liquidity is excessively tight. Some financial institutions may feel that liquidity is insufficient, but this is due to prior excessive leveraging, and also shows the effectiveness of the policy. To determine whether liquidity is tight, we should look at the cost of capital in the real economy. Whether the central bank can achieve its intended goal through the targeted reserve requirement ratio reduction depends on whether the capital released can ultimately be used in debt-to-equity swaps, and flow into small enterprises. The central bank hopes that the liquidity released will not flow into “zombie” enterprises, real estate and local government financing platforms, increasing leverage, or flow through the financial industry in an “empty cycle” because this would greatly undermine previous deleveraging efforts. However, as the central bank’s chief has admitted, it is difficult for the central bank to monitor the flow of currency through so many possible links. This shows the limitations of monetary policy in dealing with structural problems such as expensive and difficult financing for small enterprises. Monetary policy must be accompanied by fiscal and taxation reforms in order to solve such problems. When it comes to monetary policy, some market participants are happy when they hear news of easing, and worry when they hear news of tightening. This is especially clear in the securities market. Their attitude is understandable, considering their own interests. But we should never replace thought with sentiment. Some other people have said that the unleashing of a “liquidity flood” is hard to deny after it happens, but those allowing it to happen have no reason to admit it while the process is ongoing. This criticism is not ungrounded, so the central bank must provide explicit clarification for its actions and opinions.